Dental implants offer unsurpassed benefits when compared to other forms of tooth replacement. However, dental implants sometimes do cost more than other forms of tooth replacement. As a result, many feel like implants simply aren’t an option for them as some dental insurances may not cover the cost of dental implants. However, several insurances do cover parts of the treatment. For those who will still need to pay out of pocket, Kraft & Schrott Dental Associates offers payment options to help you get a new smile using dental implants. 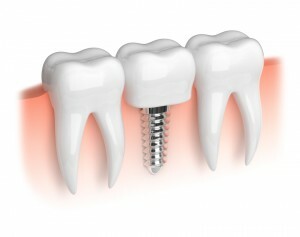 Dental implants are the most preferred form of tooth replacement because they offer a permanent solution to tooth loss. Using a bio-compatible titanium post that’s surgically inserted into the jaw bone, you’ll benefit from a long-term solution to tooth loss. The titanium post acts as a new tooth root, providing a strong and secure foundation to hold the prosthetic tooth. A prosthetic tooth is then attached to the post using an abutment to solve tooth loss. The cost of dental implants can vary considerably depending on your individual treatment plan. On average, the cost of a single implant restoration is approximately $5,000. However, that price can change depending on how many implants you need and if additional procedures are needed, like bone grafting. To make dental care easy and affordable, we accept all dental insurances except MassHealth. We are also in network for Delta Premier, Blue Cross Blue Shield Dental Blue, and Cigna. While we work with almost all major insurances, some insurance plans may not cover the cost of dental implant therapy. While insurances may not cover the cost of the implants as a whole, they may cover certain aspects of the treatment. For example, if you need to have teeth extracted prior to the procedure, your insurance likely will cover the extraction. Some insurances may cover the prosthetic crowns or bone grafts, while others may not. Even though your insurance probably won’t cover the entire cost of the procedure, that shouldn’t detour you from choosing dental implants. We strive to make dental care affordable, which is why we offer various payment options to help you with the out-of-pocket cost for implants. One of the payment options we offer is Care Credit. If you’re approved for Care Credit, you’ll benefit from flexible payment options and interest free payments for the first six months to receive the implants you need for a complete smile. Through our partnership with Care Credit, we bring you dentistry that fits your budget to gain a new smile. At Kraft & Schrott Dental Associates, we want to see you smile. We offer the affordable dental implants you need to gain a complete smile. We work with most dental insurances and offer flexible payment plans to permanently solve your tooth loss with implants. If you’re ready to regain your confidence, smile, and quality of life with dental implants, call our office today at (617) 977-5266 to schedule a consultation. Comments Off on Does My Insurance Cover Dental Implants?